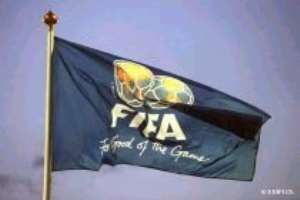 World football's governing body Fifa has thrown out an appeal by the Football Association of Zambia (Faz)requesting a change of officials for this weekend's crucial Olympic qualifier against Ghana. Faz had written to FIFA asking them to change the Togolese officials handling the Group D decider in Kumasi, Ghana. They Zambians argued that since Ghana and Togo are neighbours, the match officials could favour the Black Meteors. Both sides have 10 points in Group D but Zambia top the group as the result of a superior goal difference and only need a draw to qualify for the tournament in Athens. "As Faz, our fear was that the officials could favour Ghana because the two are neighbours," Faz spokeman Mwansa Mbulakulima told the BBC Sport website. "But they [FIFA] have rejected our appeal, instead, they have advised us to seek their intervention after the match if we feel that there were any problems with officiating. "We've been assured that they will be keeping a very close eye on things. "We are not happy with the decision, but FIFA is football's ultimate authority and if they make a decision like this one, there's nothing you can do. "All we can do is prepare for any eventuality, because for us this is like a World Cup final," Mbulakulima said. Meanwhile, Zambia have called up three foreign-based players for the match. Zambia's technical director Kalusha Bwalya has named Edwin Phiri of Swedish side Orgryte as well the South African based strikers Collins Mbesuma of Kaizer Chiefs, and Francis Kombe from Silver Stars. "Both Ghana and Zambia have played some good football to reach this stage, which is why we need a strong team," said Bwalya, who was in the Zambian team that last played at the 1988 Olympics in Seoul, South Korea.